Pharmacy group Alliance Boots is to form a joint venture with Guangzhou Pharmaceutical (GP), the third largest pharmaceutical wholesaler in China. The joint venture will run 29 retail pharmacies in China, the most permitted under Chinese rules for such a deal. GP is the leading wholesaler in its home province of Guangdong where it has a market share of about 16%. It also has a 3% share of the national market. 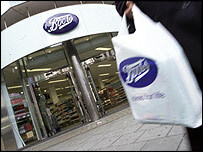 Alliance Boots chief executive Richard Baker said it was an exciting deal. "It underlies our commitment to be a major international player in pharmacy-led health and beauty," he said. "The Chinese market has good growth potential and this move demonstrates our belief in the ability of the group to drive growth through developing opportunities in new markets." Boots, whose retail arm is in Nottingham, said the joint venture would bring together strong local management and "our extensive experience in running pharmaceutical wholesaling businesses". Yang Rongming, chairman of the joint venture partner, said: "We are delighted to be forming this joint venture with such an experienced international partner with proven excellence in the operation, acquisition and integration of pharmaceutical distribution businesses." The formation of the joint venture is conditional upon receiving approval from Guangzhou Pharmaceutical shareholders, and various government and regulatory approvals. It is expected to be completed in the second half of 2007 and will expand Alliance Boots' wholesale presence to 15 countries.